New Sinology 後漢學 encourages a multifaceted understanding of China and the Sinophone world, one grounded in an ability to appreciate critically the living past in China’s present. This approach essays a more holistic understanding of ‘things Chinese’ relevant not only to academics, but also to a wider, engaged public. For an overview of New Sinology, and a series of essays on the subject dating from 2005, along with an Archive of earlier relevant material, see the reading list below. Many scholars and translators with a broad-based foundation in Chinese Studies regret the narrow over-specialisation imposed on students by today’s metric-driven academic institutions. They remember when ‘Sinology’ was wide-ranging and humanistic. All too often modern disciplinary specialisation limits the conception of the Chinese world, a world that has always placed such great faith in the holistic understanding of the full range of interwoven human activities. Today’s corporatised education system too often leaves students of China well versed in the professions, but unable to understand with ease and fluency the wellsprings of what China is today. Deprived of the broader linguistic and cultural context, they are ill-equipped to understand, translate or engage with such daily essentials as online discussions, coded commentaries or sometimes even newspaper headlines, let alone the myriad traditional concepts used by Chinese thinkers, politicians, economists and strategists in articulating China’s sense of itself and its new place in the world. Such a deeper understanding requires at least a passing familiarity with Classical Chinese 古文 and Literary Chinese 文言文 (and the world to which they allow access), something most Chinese pick up from an early age, or have to study at school. New Sinology responds to this deficiency, based as it is on the understanding of the broader Chinese world, an experience (found in the ‘old’ Sinology) that was built up in particular over the past four centuries of contact with the Chinese world, and that has been renewed by our efforts since 2005, promoted through practice with the creation in 2010 of the Australian Centre on China in the World and by The Wairarapa Academcy from 2016. New Sinology advocates a multifaceted intellectual engagement with contemporary China, with the modern Chinese-speaking world in all of its complexity, based on strong foundations in both the classical and the modern Chinese language and in deeper studies of China’s past and present, be they done in China, Greater China or internationally. New Sinology advocates an approach to contemporary China that appreciates the overculture of the dominant Chinese Communist Party and what, through ideology, its policies, the mass media, the education system and its internal and global propaganda efforts the Party promotes as Official China. It also inducts those engaged with China into the particularities of Translated China, that is the versions of China advocated by the Party authorities through their selective approach to and interpretation of the Chinese world, be it in the contemporary context or that of the tradition or the twentieth century. New Sinology is vitally engaged with the Other China. That is the multifaceted culture and society that has existed in counter distinction to the orthodoxies 正統 that grew up from the time of the pre-Qin philosophers. The Other China, always a vital part of social reality, re-surfaces in popular and elite culture at times of political anomie and intellectual diversity over the centuries. This Other China has flourished again since the 1980s and exists variously in creative tension or subjugated compliance with Official China. The founders of The Wairarapa Academy have been engaged both with the Other China and Official China from the early 1980s through their translation work and writing, starting with Trees on the Mountain, a special issue of the Hong Kong-based translation journal Renditions devoted to contemporary Chinese culture. A robust engagement with contemporary China and indeed with the Sinophone world in all of its complexity, be it local, regional or global. It affirms a conversation and intermingling that also emphasizes strong scholastic underpinnings in both the classical and modern Chinese language and studies, at the same time as encouraging an ecumenical attitude in relation to a rich variety of approaches and disciplines, whether they be mainly empirical or more theoretically inflected. In seeking to emphasize innovation within Sinology by recourse to the word ‘new’, it is nonetheless evident that I continue to affirm the distinctiveness of Sinology as a mode of intellectual inquiry. New Sinology is about an intellectual, cultural and personal involvement with the Chinese world (be it in the People’s Republic, Hong Kong, Macau, Taiwan or globally) that is underpinned by traditions of academic independence, local fluency and disciplinary relevance. It is an approach to the Chinese and Sinophone world that pays due accord to the demands of academic disciplines while essaying a more holistic understanding relevant not only to academics, but also to a wider, engaged public. Western Sinology, or Hanxue 漢學 in Chinese, has a venerable history that dates back to the late-Ming dynasty in the sixteenth century. Early Christian missionaries in their attempts to sway Ming subjects, noble and common alike, familiarised themselves with indigenous traditions of thought, history, literature and scholarship, which were known as Hanxue, the accumulated body of learning that predated the Christian era and which formed the basis for rulership, culture and thought in Ming times. Their study of what in Chinese is known as the nexus between literature, history and philosophy 文史哲, a competence in which was deemed essential for those who ruled the empire, was from the start a collaboration with Chinese scholars and thinkers, as the study of the Chinese world would continue to be. After all, Chinese were the first Sinologists. Western Sinology developed as a broad-based attempt to understanding and engage meaningfully with Chinese ways of thinking about and ordering reality, with the hope also of influencing China and its ruling elite. In the colonial age some would dismiss Sinology and Sinologists as symptomatic of those who had ‘gone native’, or who were too bookish, disengaged or irrelevant to the pursuit of more material goals. In reality, from the nineteenth century, the study of China has often been intimately related to economic, political and cultural agendas. In the early twentieth century, in keeping with the temper of a modern nation state China’s unique scholastic and intellectual traditions were recast by some conservatives as ‘National Learning’ 國學. In many cases, National Learning 國學 and Sinology 漢學 are interchangeable, although Chinese Sinologists are often spoken of as specialists in National Learning. As China has reformed economically and revitalised intellectual and cultural agendas since the 1980s, National Learning has enjoyed a widespread revival (and massive state funding). The resurgence of National Learning and the persistent relevance of Marxist-Leninist, and particular Maoist ways of thinking, acting and talking add to pre-1949 traditions of Chinese scholarship and statecraft. Together this Chinese reality demands an approach to the study and understanding of the Chinese world that can meaningfully engage with powerful revived traditions as well as with the discourses of the regnant party-state (a point elucidated at length in Geremie Barmé’s essay on New China Newspeak). It is in this context then that a pursuit of a New Sinology is both timely and relevant. In the post-WWII Western academy, ‘China Studies’ 中國學 along with a range of more professionally focussed disciplinary approaches would enrich scholarship. However, this kind of professionalised and often narrow focus often came at the expense of a more integrated approach that suits better an understanding of a civilisation as varied and complex as that of the Chinese world (a point forcefully made by the historian Frederick W. Mote of Princeton University at a Symposium on Chinese Studies and the Disciplines in 1964, see the Recommended Reading above). Today, academics concerned with producing work primarily for themselves can perhaps too readily use China and their research as a footnote, or as a case study for regimes of knowledge production suited best to the industrialised global academy. Valuable work and hard-won insights are accessible to specialists certainly, but frequently they are disengaged from the mounting public interest in ‘the rise of China’. In the post-Cultural Revolution era of Chinese reform, re-evaluations of the past and the rehabilitation of conflicting traditions (ancient, dynastic and modern) previously occluded by High Maoism would make this more integrative, and demanding, approach to the study of China more pressingly relevant. The basic skills in language (modern and various forms of the literary), understandings of philosophy, history and literature have again become important for those who would enjoy a broad-based involvement with the thinking Chinese world, not only for scholastic purposes, but so as to better understand how China’s present and future are in constant commerce with its past. If Chinese political leaders, strategists, business people, academics, media figures and the public generate new ideas and approaches to deal with Chinese problems by employing the resources of tradition alongside modernising international paradigms and practices, surely any basic education in Chinese Studies would require an appreciation of the National Learning that decocts those traditions for modern use. To develop such fundamental abilities, and to equip at least some well enough to embark on this undertaking requires a few of the approaches once common to a Sinological training. The prominence of China on the world stage requires not only strong professional training in disciplinary ability, but just such a broader awareness and education. Just as understanding the ci-lyric style of poetry developed in the Song dynasty gave earlier generations of political scientists insights into Mao Zedong’s thinking (the Chairman often expressed himself using this millennium-old literary form), so too today a basic appreciation is necessary of classical modes of thought, literary tropes and historical anecdote, now frequently employed by Chinese thinkers, advisers and business people as a recrudescent China addresses the world not only in the modish language of global norms, but also in ways particular to what after all is a world civilisation. To rely entirely on official Chinese party-state interpretations of China’s past, be it of Confucianism, or the concept of Tianxia 天下 (frequently employed by Chinese IR specialists and strategists), or even ‘New Tianxia-ism‘ (Xin Tianxiazhuyi 新天下主义), harmony and ‘traditional values’ is to surrender to a ‘translated China’, one in which alternative understandings of China’s complex socio-political worldviews are edited out as once more the past is made to serve the present. Scholars of Chinese politics, thought, history, commerce and various other fields often lament the over specialisation required of academic life today. It is a specialisation that cauterises the Chinese world (a world that places great faith in its autochthonous understandings of and approaches to the full range of human activities). Industrialised and corporatised education leaves many students of China well versed in the professions but stymied in understanding with ease and fluency online discussions, newspaper headlines and coded commentaries, as well as a myriad of traditional concepts redeployed today by thinkers, politicians, economists and strategist, as much as they are frustrated when watching kung-fu movies (which require a passing familiarity with literary Chinese, something most Chinese viewers pick up from an early age), or understanding the latest political gossip. All of these things require a grounding in skills that are too readily, and carelessly dismissed as ‘Sinology’. If the overarching presumption among the academic bien-pensant remains determined predominantly by Euro-American-centrism, a solipsism that predicts that the Chinese are becoming more and more ‘like us’, then there is perhaps limited need to understand better the fundamental underpinnings of Chinese ways of seeing, thinking and acting. Or indeed, the ways in which the Other China challenges Official China’s construction of reality. After all, sooner or later we will all enjoy a global convergence; until then relying on Translated China and constructing a provincialised China that remains in the thrall of Western intellectual metropoles will suffice. In that case, a Western-determined universalism, underpinned by neo-liberal core values, in academia as in other realms, may well continue to relegate a Sinology that attempts to engage with ‘things Chinese’ from an inner understanding while maintaining the protocols and values of scholarship, to fustian irrelevance. Intellectual atomisation serves well the policemen and -women of an academy that quantifies its meaning primarily in disciplinary terms and audited outputs and outcomes. Those who find interdisciplinary and inclusive approaches germane to the life of the mind, however, will appreciate the more complex appeal, as well as the utilitarian value of a New Sinology. New Sinology was first propounded in 2005 and, since then, I have developed the ideas related to this approach to China as part of the China Heritage Project (2005-2012) and as the founding director of the Australian Centre on China in the World (2010-2015). Some of the material in this section previously appeared in the e-journal China Heritage Quarterly and The China Story Journal, which I founded in 2012. The China Heritage Project and the Quarterly evolved as part of an Australian Research Council Federation Fellowship, which I held at The Australian National University (ANU). These endeavours are continued in China Heritage. Without long years of support from ANU and the Australian Research Council, my previous work would not have been possible. 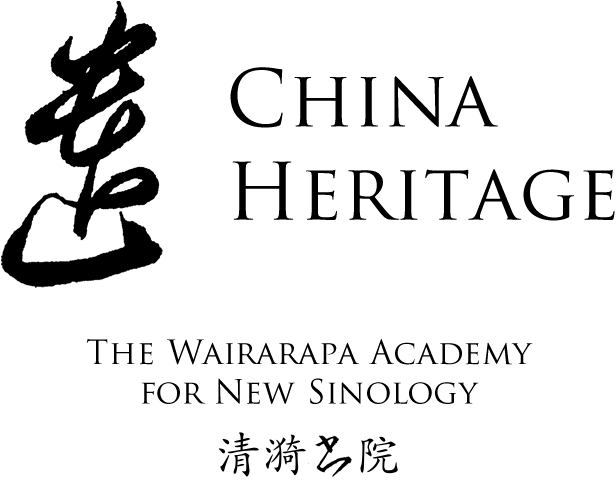 I would also like to acknowledge and thank Ian Chubb, Bruce Doar, Judith Pabian, Gloria Davies, Jude Shanahan, Daniel Sanderson and Kevin Rudd for their encouragement and contributions to the first ten years of New Sinology.